STP Bench Number : 3 - A Review of HeartMath's "Heart Intelligence"
"HeartMath," occupying STP Bench Number 3 here in our virtual lab, has a recent book out entitled "Heart Intelligence: Connecting with the Intuitive Guidance of the Heart." Here is a link to HeartMath’s web page to see how they present themselves. This provided an opportunity to learn what, if anything is new in HeartMath LLC's message, material, outreach and approach. For those who have never read a thing from HeartMath, or don't know HeartMath, this text will serve as a good introduction. For those who have read their material, especially if that includes Doc Childre's earlier works, and the "HeartMath Solution," well the Reader will not find much that is strikingly new. Nevertheless, such a compilation can when successful, provide a unified sense of a company's message or Gestalt (quite appropriate in the present case). As is my habit (not always the best, and certainly not time-efficient!) I took my Reader's Notes as I read through this latest work. These may be of use to others, so I have also placed them here. Be aware at the outset that these Notes occupy 15 pages! But one can read through them rather quickly. Clearly, since I take such Notes primarily for my own personal use (15 pages in 2 years, will be a quicker re-read than the book's 266 pages), these Notes may not serve your needs perfectly. So here is the link to a PDF version of my Reader’s Notes for "Heart Intelligence." Download it, and read at your leisure, if you prefer to reading it now in the browser tab that will open. Reader’s reaction and opinion: I find Childre’s ending (this phrase and more, that appears above this line in the book) to this multi-authored book (always a quality challenge for the editor) quite well-written and strong. It prompts one to want to send messages of encouragement for such information and communication from one person who has thought things through, to the many who have not, and could benefit from reading some Childre. This source (Childre) will have a much greater chance of contributing to Peace in our world, than all the magnetomers that a whole army could sink into the ground. Why? Because the former has the right motivation, while the latter is obviously tied to too many other agendas. In the scientific domain, output based on a broad-based and well instructed foundation, seems too often missing here. Thinking that one will become known by the company one keeps as a scientist doesn't work. Scientific investigation is not a process that rubs off onto one, it's a vocation. In fact, true Science will invariably leave its "practitioner" (researcher, if you prefer), inescapably exposed. If you have the vocation, you know that comes with the turf and almost welcome it. If you don't have that vocation, and lack especially the deeply-rooted foundations to keep your hypothesis upright, it will become painfully clear soon enough. It's just a matter of time, aided by those who patiently test to see if they can duplicate your results, or if your card castle comes crashing down. It's not for dabblers. But if one prefers to leave the rigorous, linear, coldly analytical processes of Science behind, finding its methods a bit oldish, in favor of more up to date flights of fancy, ... well, that's another quantum story. All material cited in quotations, and graphic results included in these attached Reader's Notes are the intellectual property of the following authors and the Institute of HeartMath and HeartMath LLC. The author of these Reader's Notes assumes no responsibility for the content of "Heart Intelligence: Connecting with ..., etc." Childre, Doc; Martin, Howard; Rozman, Deborah; McCraty, Rollin (2016-02-14). 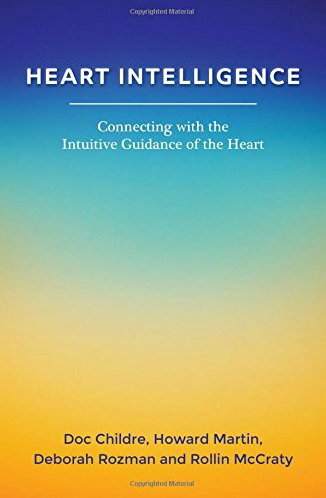 Heart Intelligence: Connecting with the Intuitive Guidance of the Heart. Waterfront Press. This reading and review of this work was of use here at STP, and hope it can be of use to others. Good reading! Of either these Reader’s Notes, or buy the book (on Amazon, of course), or both.